You may use hair dryers and stylers, or not, but there’s something you cannot dispense with – a hairbrush. Since it is used several times a day, it’s crucial to find a model that would be both functional and friendly for your hair. A wooden brush is a tried-and-true option that would be perfect for everyone! 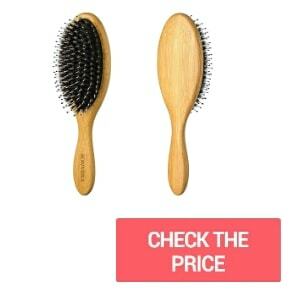 0.1 Why using wooden hairbrushes is the right choice? 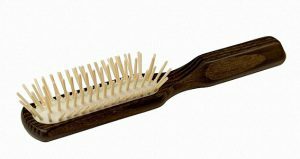 Why using wooden hairbrushes is the right choice? 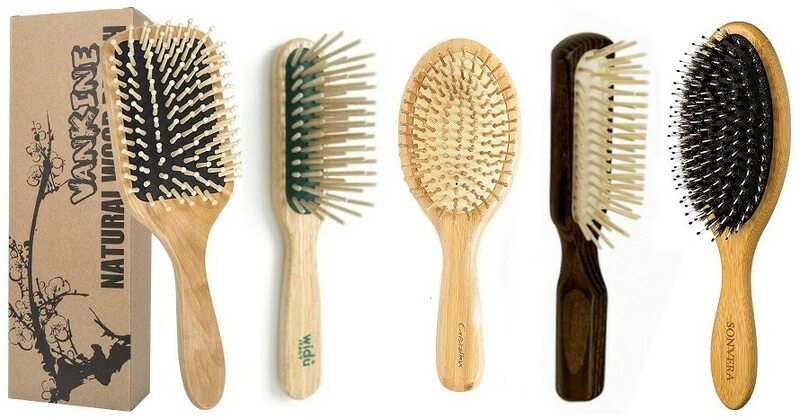 In fact, a wooden brush is a pure benefit for your hair: there is no healthier alternative on the market. 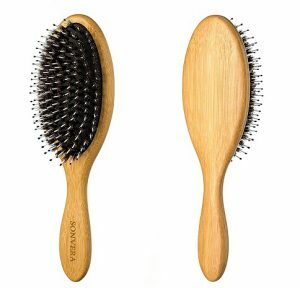 What are the main advantages of wooden brushes for hair? Unlike metal and plastic bristles, it produces less static. When your hair is electrified, you have these hateful fly-aways that cannot be smoothed down, frizz and constant tangling. With a wood hair brush, your hair lies still. Delicate detangling. Even the smallest sharp corners and edges of plastic bristles can pull and tear hair strands, while wood bristle hair brush will be far gentler. Bristles with round ends are perfect and safe. When you pass through your hair with a wooden brush, it spreads natural oil (sebum) over the strands so that you could enjoy a healthy, shiny and sleek look. This way, you protect your hair and prevent it from drying and breaking. Massage made by rounded ends of bristles stimulates blood flow to the scalp and boosts hair growth. Besides, with more blood hair follicles get more nutrition, and produce more sebum. It means you have healthier and optimally moisturized hair. Environmental friendliness. Bamboo hair brushes have antibacterial and antifungal properties, which protects hair from falling and diseases. Besides, it is fully recyclable, and bamboo is the most convenient material – it grows faster than any other tree. 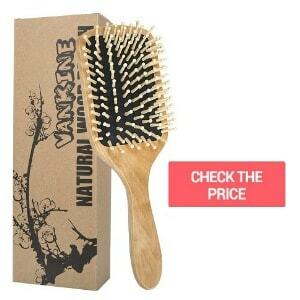 If you have thick middle-length hair, this can be the best wooden hairbrush for you. It combs hair very delicately and precisely while distributing natural oils from roots to tips, which allows covering the entire strand instead of leaving oil on the roots. Although boar brushes are rarely applied now, you will quickly get used to it and evaluate its advantages. 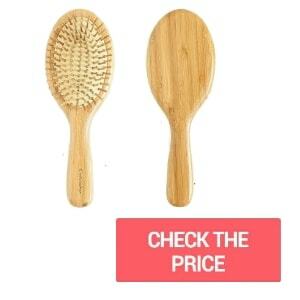 Sonvera wooden hair brush weight 1.6 ounces only, and lies perfectly in the palm. It has anti-static properties, reduces frizz and prevents hair breaking while retaining their elasticity. Boar bristles also contain keratin which helps to seal split ends. it is a 100% natural brush that protects hair and covers it with natural oils. fine boar bristles are not suitable for thick and long hair – they tend to tangle a bit. Looking for a cheap and chic solution? 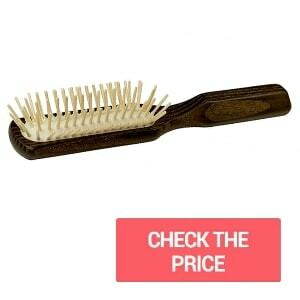 This wood bristle hairbrush has everything you need, nothing you don’t. Its long wooden rounded bristles can easily comb through very thick strands without pulling and breaking them. Proper massage of your scalp is guaranteed! 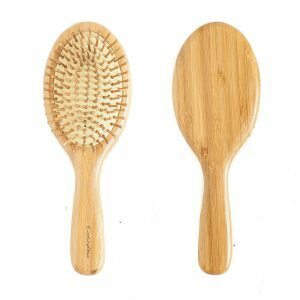 This wooden paddle hair brush is literally suitable for everyone: it detangles even curly hair, and works well regardless of their length. Since it’s made of absolutely natural materials, it can also be used by children. However, the model is rather big for them. To top it off, the model is very durable and long-lasting: it’s not so easy to break its bristles! a safe and robust hairbrush that is equally suitable for every hair type. there’s nothing to find fault with if you don’t need a brush with intricate design. Another 100% natural solution is offered by Cristalbox. The manufacturer put focus on convenience and safety: it is rounded at every edge, and the handle doesn’t slip in hands. A truly well-thought-out design! 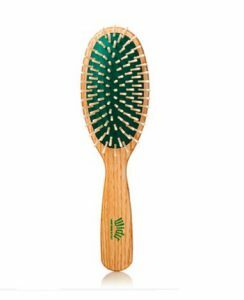 The bristles of this bamboo comb are moderately long, dust-proof and rounded, which makes them perfect for scalp massage. 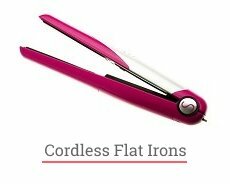 The material is anti-static, so you avoid frizz, tangling and split ends. Cristalbox brush is suitable even for knotting, curly and frizzy hair – it will solve these problems in a touch! The brush also distributes natural oil along the entire length of hair making them healthy and shiny. That prevents dandruff and damage of scalp. As a small bonus, manufacturer offers a 12-month guarantee. made of 100% bamboo, safe and convenient design. This wooden handled hair brush is perfect for daily use: it’s simple but handy. Being made in Italy from ash wood it’s long-lasting and reliable. However, if somehow you break some bristles – there are a few bristles for replacement coming in the set! Widu anti static hairbrush reduces frizz and makes combing easy and safe. Since it distributes natural sebum from roots to tips, it protects the structure of hair and prevents breaking and thinning. The only disadvantage is that the bristles are straight, so this model is not the best option for massage. However, some users love this shape of bristles more – it eases combing. bristles don’t have rounded tips. Unlike the above-mentioned light wooden brushes, this one is made of maple by German masters. Its bristles have a special waxy coating for easy and safe combing and protection of hair: such model is perfect for daily care. Made of oiled thermowood, it’s resistant to water and moisture, so this brush is more durable than its analogs. Users will also fall in love with a stylish dark coloring of this model and its smoky scent. has a special coating of bristles. a bit heavier than the other models. Now you know that there are numerous wooden hairbrush benefits: it’s the best choice for those who care about hair and want to keep it healthy. What is your favorite wooden brush? Leave your comments below. I’m trying to decide between Tek, Widu and Redecker brushes. The olive wood or thermowood Redecker seem very interesting but I thought I’d ask your opinion as I can’t have hands-on prior to purchase. In comparing the Widu and Redecker brushes is there anything that makes one stand out over the other, feel, build or general quality? If you could buy any wooden pin brush which would it be? These two brushes are intrinsically good. But if it doesn’t matter very much to you, I recommend you to choose Burstenhaus Redecker Maple Wood Brush of course. I like it for its hefty handle, the brush feels great in hand. 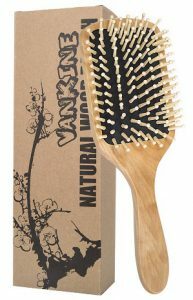 The brush is made from olive wood and features maple straight pins and bristles – making it ideal for long and curly hair. I’ll look into that. Thank you. 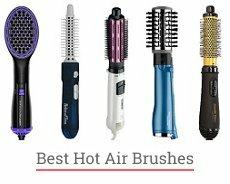 I’m looking for a brush to use on wet hair for drying. My hair is thick and wavy and always looks frizzy no matter what I do. Which Brush should I use? I do not recommend to brush wet hair at all. When hair is wet, it is especially vulnerable to damage. Water weakens the weakest bonds within strands of hair, removing its strength. The simple act of brushing can lead to dire consequences in this weakened state. If you really can’t wait to brush your hair, you should use a wide-toothed comb. This will cause less damage than a regular brush. Choose a comb, like Burstenhaus Redecker Maple Wood Brush. This brush is wide-toothed, and its bristles have a special waxy coating for comfortable and safe combing and protection of hair. Thank you for such a big piece of useful information! 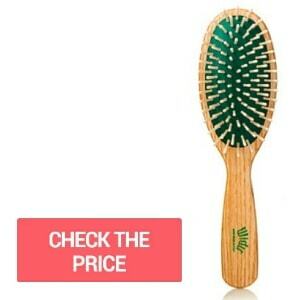 The bamboo bristle hair brush benefits are indisputable. I just hate the static produced by plastic hair brushes, it’s so annoying. My first wooden hairbrush was a real treasure to me. Monica, this article is a real treasure for me! I don’t like plastic hairbrushes because of the statics it produce but my new Widu hair brush wooden bristles do not make any statics at all! I’ve forgotten that terrible feeling of sparks in my hair while brushing it. I used to try other cheap wooden brushes but that’s not an option for me – the bristles are so fragile that you have to throw the brush away after using for just a couple of times. I think it’s better to purchase one of those Monica recommended here. Thanks for sharing! Thank you for sharing, Amelia! I hope you’ve enjoyed my blog.